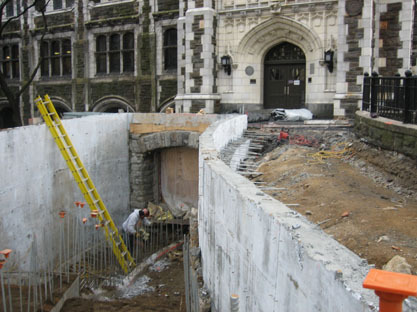 Entry Ramp Takes Shape: Central to the entry redesign is the reconstruction of the original ground floor entrance. In addition to the salvaged schist stone wall, concrete retaining walls form the stair opening leading down to the original lower level stone arch entry. Earth and gravel fill are compacted to serve as a supporting base for the new concrete stair slab. 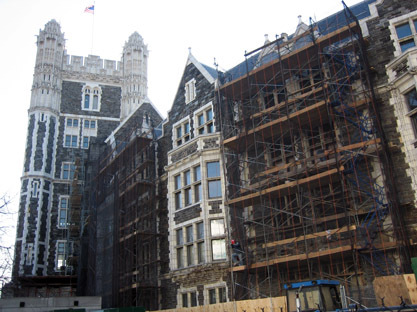 Facade Reconstruction Underway: Scaffolding has been erected and selective demolition and removals have begun on the main building. 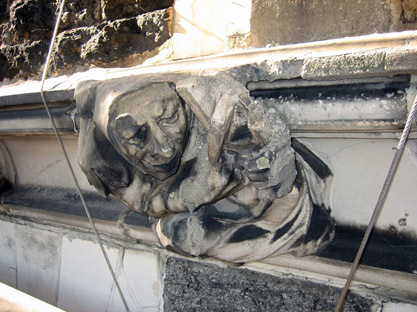 The first step of the facade reconstruction is the selective removal of existing terra cotta sculpture to serve as models for new Glass Fiber Reinforced Concrete (GFRC) replicas. A rigorously tested thin-shell GFRC, strong, light weight and durable, has been the material for all the terra cotta reconstruction. The entire reconstruction, totaling over 65,000 pieces, is currently the largest GFRC reconstruction project in the world. Following careful removal of the representative sculptural pieces, demolition of the remaining terra cotta will begin. Steel lintel Investigation: Meanwhile, the demolition of the existing terra cotta window surrounds exposes the original steel lintels that support the window openings. 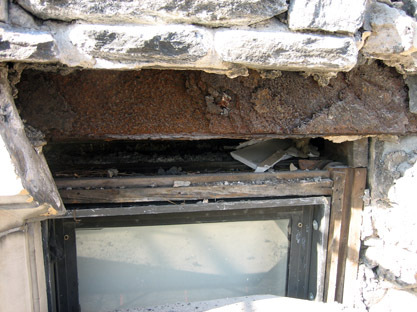 Each steel lintel is inspected to determine its structural viability. Where possible, salvaging the original steel is preferred. Schist Stone Sounding: Local Manhattan Schist stone is the primary façade material of Shepard Hall as well as the other campus buildings originally designed by George Post. Through a process called “sounding,” each stone on the building is struck with a mallet and the sound produced is an indicator of the stone’s integrity. 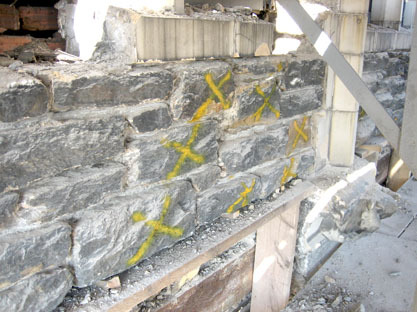 Stones that sound “hollow” or are visibly damaged or deteriorated are marked by the design team for replacement. Stay tuned for continued updates from the field.